The fifth edition of Case Management and Rehabilitation Counseling is compatible with the seventh edition of Foundations of the Vocational Rehabilitation Process (Rubin, Roessler, & Rumrill, 2016). 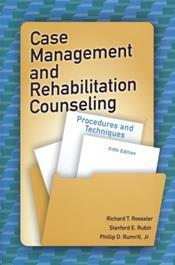 By combining the seventh edition of Foundations with the fifth edition of Case Management and Rehabilitation Counseling, rehabilitation educators can effectively coordinate a two-semester study of the foundations, components, and operations of the rehabilitation process and the role and function of the rehabilitation counselor in managing that process in various public and private service settings. With 349 new references, the new and updated material expands the amount of information on multicultural considerations in counseling, family involvement in the rehabilitation process, the use of technology in case reporting and record keeping, and reasonable accommodation in the workplace. Thus, the reader gains an up-to-date understanding of counseling and case management skills within the current practice milieu of rehabilitation services. Select this book as a textbook for courses in rehabilitation education programs, specifically courses in rehabilitation counseling/case management and supervised practicum. For the latter area, the book structures a series of experiences that students should complete during their field placements. Ideally, as students study chapters on intake interviewing; medical, psychological, and vocational evaluations; information processing and rehabilitation planning; placement; accommodation planning; ethical decision making; multicultural counseling; and caseload management, they should participate in related field experiences. Students would have an opportunity for first-hand practice of the principles stated in the time-tested Case Management and Rehabilitation Counseling.